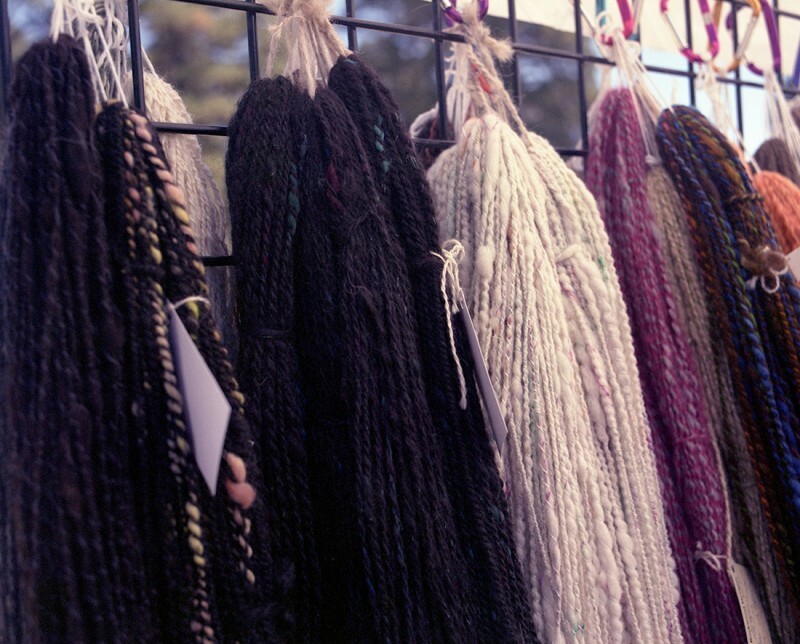 Kate and I went to the Elizabeth (Colo.) Fiber Festival last summer, and I took along the Pentax 6×7 and a pro-pack of expired Fujicolor Professional 160 NPS film. 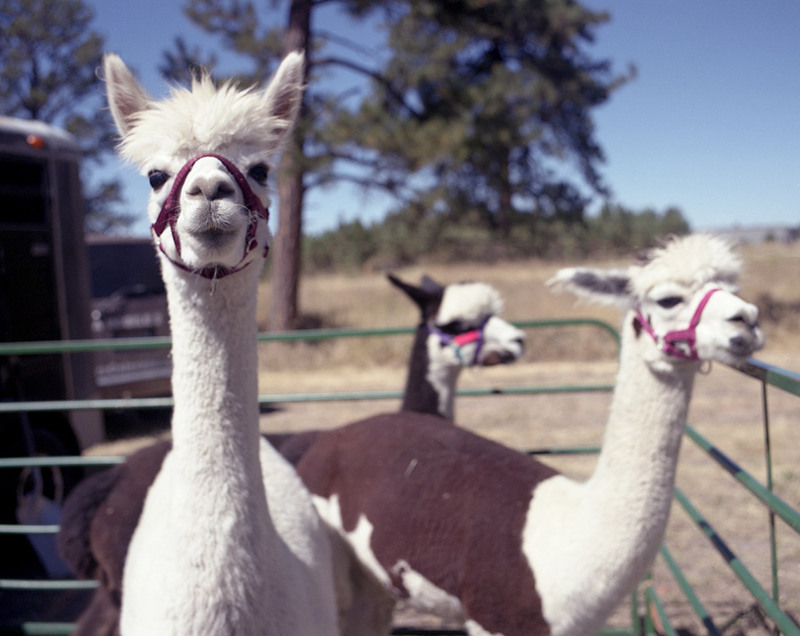 Incoming: My impressions of the event, the film, the camera, the fiber and the alpacas. I can’t speak from a whole lot of experience, this having been my first fiber festival, but Kate said it was relatively small. 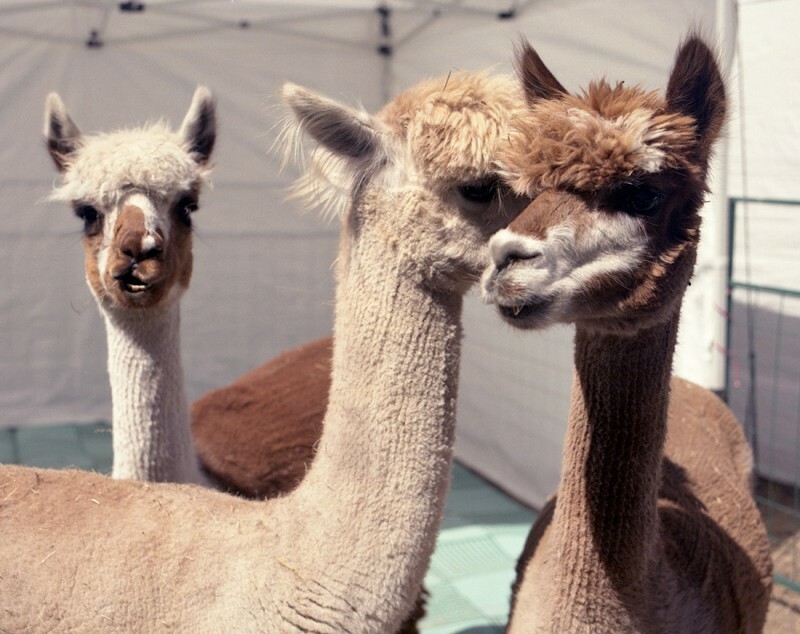 She also pointed out that it was almost more of an alpaca show than a fiber festival. I can see why: there were several dozen alpaca breeders (as well as a few llama and sheep ranchers), while there were only a few vendors selling any kind of finished fiber goods (roving, yarn, etc.). There are two kinds of alpacas, and llamas are kind of like the alpacas’ over-protective big brothers. No, really: Llamas are excellent livestock guardians, especially in Colorado, where the climate (low humidity, relatively low heat) closely resembles the high Andean meadows the llama developed in. Alpacas are smaller and more skittish, but llamas get along well with alpacas, sheep, and other livestock. While a llama may be no match for a pack of coyotes, they can be an effective deterrent for many smaller lone predators and small groups, making them very effective on the Eastern Plains where direct threats to llamas — bears, mountain lions, wolves — are less common. Llama fiber isn’t as desirable as alpaca fiber in general, though, because it’s on the coarser end of the spectrum. Obviously, when you think of yarn, the first thing that jumps to mind (assuming you’re as offended by the idea of acrylic as Kate has convinced me to be) is wool — sheep’s wool. Alpaca is considerably softer, however; the nearest competitor in the ovine world is merino. While alpaca is not quite cashmere (from goats) or angora (from rabbits), it is highly desired for its more affordable softness. It’s worth noting that both angora and cashmere are actually hair, not wool. Major differences between wool and hair fiber include fiber density, and the hollow cores of wool fibers. 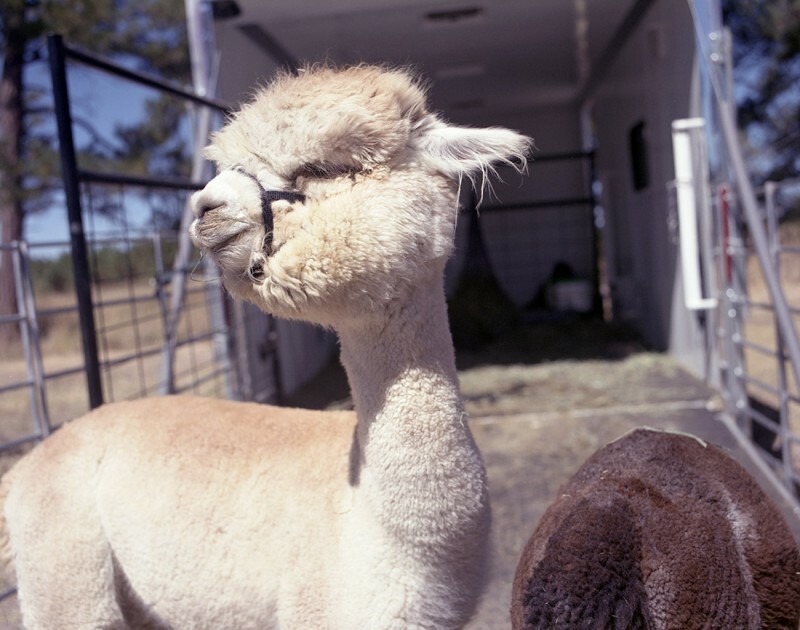 Alpacas come in two flavors: Suri and Huacaya. More common Huacaya alpacas have the soft, fluffy fiber desired for spinning and weaving, and appear fluffy as a result. Suri alpacas have shaggy, silky fiber that dangles in bundles and gives them the appearance of some unholy union twixt sheepdog and giraffe. There are a lot of alpacas for sale cheap these days. 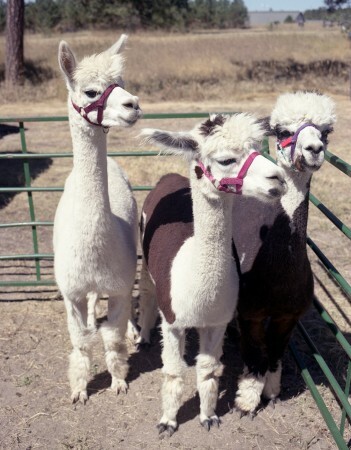 In the 1990s alpacas’ popularity rose and a lot of people made decent profits breeding and raising them for fiber. Since then, however, the market has become saturated and taken a downturn. These days, many people are keeping alpacas more as big, cuddly fiber-bearing pets to feed their fiber habits, rather than counting on big profits. It sounds like many are lucky if they can sell roving and yarn for enough to feed the herd. The vendors of fiber products did have a wide variety. For sale were yarn in a dozen weights, as well as its predecessors: roving, fiber and even fleeces. While everyone knows wool is spun into yarn, the complexity of the process is unexpectedly … uh, complex. Obviously it starts with the sheep. Once a year a sheep’s wool coat has grown thick enough to be shorn into a fleece. The fibers still stick together, thanks to barb-like structures along the shafts, even when the sheep is removed from the middle. This “grease wool” is full of oils, as well as dirt, grass, poop and whatever else. The parts from the back end of the sheep may be too caked with poo to be usable and are often discarded. The fleeces are then cleaned, either in a detergent bath that uses a lot of water, or in an acid bath that just dissolves the grease and grass. The fleeces are then dried. Next comes picking, or teasing, which spreads the clumpy locks of wool apart into web-like structures. This is done by a machine these days, which may add a light oil that helps the fibers stick together but allows them to move in relation to one another. 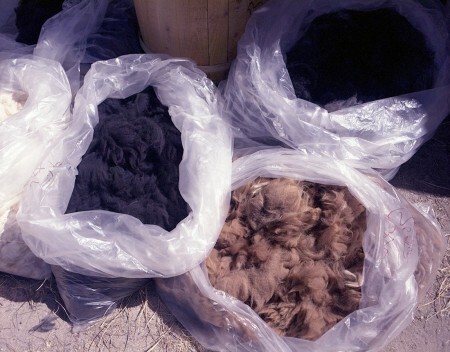 The wool fluff is then blown, loose, into a room, box or bag. The wool fluff must then be carded, a kind of combing or brushing that can, depending on the method employed, align the fibers into tight, narrow lines (almost like threads), or into an even-but-random web of fibers (think something like the batting in a quilt). At the end of the carding process, the resulting wool is divided into strips called rovings. Roving looks like huge, loosely-woven yarn. If it’s destined for hand-spinning, the roving strips will be quite thick — maybe as thick as your wrist. For machines, and for wool destined to be made into thread, much thinner strips are used (pencil roving). Roving is then spun into yarn by pulling and twisting it, which causes the barbed fibers to lock tightly together. An automatic spinning machine can be used, but these days hand-spinning is enjoying a renaissance. 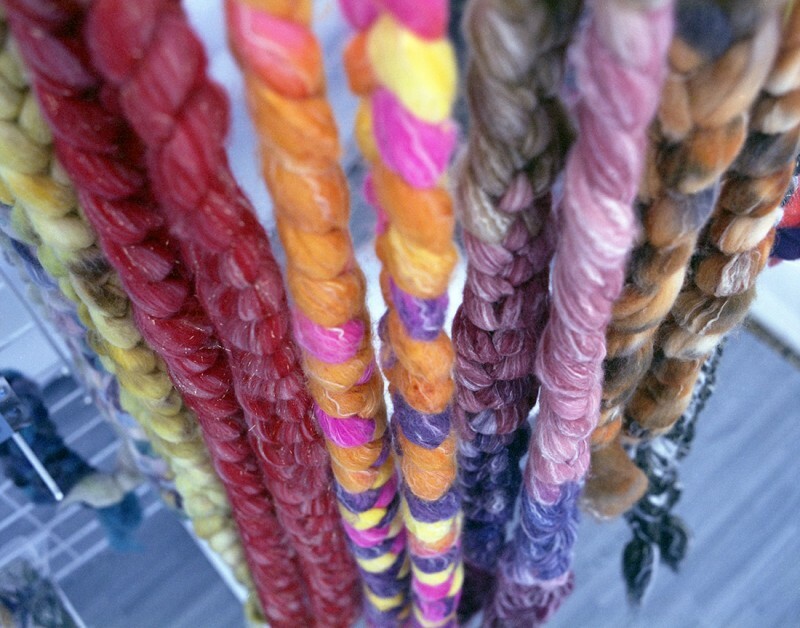 Yarn can be spun by hand with either a spinning wheel, or a drop spindle. A spinning wheel uses a large flywheel to maintain a very constant rate of rotation on the spool. Roving is pulled onto the rotating spool as the spinner feeds it evenly into the mechanism, twisting at the same time. A drop spindle dangles from the roving and is spun by hand, using its rotation to twist the fiber as gravity draws the yarn down. Aside from being spun into yarn, un-carded fiber can be felted into … felt. 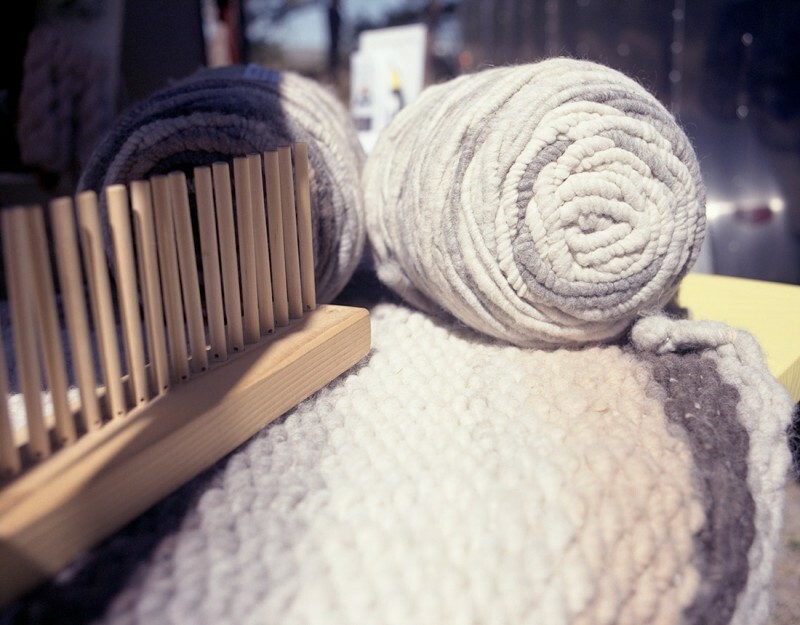 Combining both processes, fulling involves felting a garment or piece of fabric that first has been made from roving or yarn through knitting or weaving. 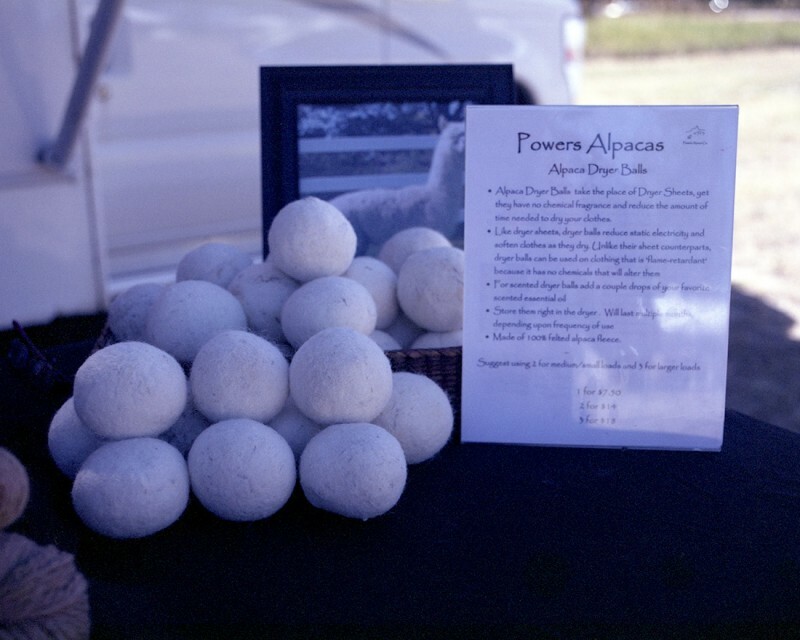 Llama or alpaca fiber, and pretty much any other kind, is prepared in much the same way as sheep’s wool. Other fiber-bearing livestock include goats, yaks, Highland cattle, rabbits, bison, vicuña and even some breeds of dog. Sheeps’ wool remains king because it combines relative softness with relative ease and economy of production. Alpacas produce less fiber per year, per animal than most breeds of sheep. This is a really basic overview based on information from Blackberry Ridge Woolen Mill and Ranching With Sheep, and is not meant to be exhaustive. I got the unopened propack of Fujicolor Professional 160 NPS at the Denver Photographic Society’s swap meet in spring 2015. Physically it was in good shape, and despite having expired in 2005 I figured it was probably in pretty good shape for several other reasons. When it comes to looking at expired film, I consider several factors — I generally tend to think professional emulsions are more likely to have been owned by someone serious about photography for at least part of their lives. In addition, I believe medium format film made in the last 20-30 years — long after 135 film became absolutely market-dominant — was likely purchased by a serious or professional photographer. Lastly, anyone buying medium format in bulk (or, at least, the semi-bulk of a propack) must’ve expected to use it. Any of those more-serious buyers likely would’ve known how to store film properly, and so it was likely stored well for at least part of its life. In spite of having all that going for it, it was still 10-year-old film, so I rated it at ASA 100 — about two thirds of a stop below box speed — to be on the safe side. All these photos were taken with the Pentax 6×7, and most with the SMC Pentax 45mm f/4.5, and I used the TTL prism viewfinder’s internal light meter. I learned two things about alpacas: First, they are incredibly soft — even when they’re filthy! And second, most of them are scared of the Pentax 6×7. The few who aren’t are very curious — right up until I hit the shutter release the first time. KA-CHUNK! As for the film’s characteristics, it’s strongly reminiscent of Kodak Portra 160NC. It’s not quite as muted as modern Portra, but the colors are only moderately saturated and seem fairly accurate. It might tend slightly toward the blue, but that could also be an age-related color shift. And, while you can’t really see it in these examples, I found the skin-tone rendition very pleasant. Despite its moderate saturation, reds are excellent and even tend toward the vivid. The contrast is in the middle, or maybe on the high-end of moderate. Resolution is superb and the grain is very even and pleasant. With this excellent sharpness, and aside from the lack of unusual saturation, these images are so clean and sharp they almost could have been made with a digital camera. Fortunately, they aren’t quite as sterile as that. I think exposing it at ASA 100 was just right. I had the film processed normally and did virtually no exposure adjustment in scanning or post-processing, and I’m very pleased with the results. Conclusion: I really like this film and will happily buy more if I get the chance. It’s a shame it’s discontinued, because I find its muted, lifelike tones much more pleasing than Fuji’s remaining professional color negative film, Pro 400H. In the meantime, I have plenty of expired Portra 160VC, and the modern Portra 160 is similar enough to be very satisfying. Further reading: When Kodak released the Portra NC and VC emulsions in 1999, Popular Photography compared them to Fujicolor Pro 160 NPS and several other films.